I think I first met Billy Ruane in 1988 when I sat in with a friend’s band at the Middle East upstairs. I was back from college on a winter break that turned into a year long hiatus in which I attended a bunch of Billy’s shows. At that time, The Middle East Downstairs was still a bowling alley and until recently, the entertainment upstairs had been mostly belly dancing and other light cultural fare. In the legendary Boston rock origin story, Billy Ruane changed all that in 1987 and lit the fire that still burns in Central Square. In the family of Boston rock, Billy was the crazy uncle who always came with arms full of gifts (even if they were sometimes as mysterious as a trunk full of scavenged biology texts). The other night as I wallowed in Pabst Blue Ribbon while watching old footage of Billy at the closing of Mojo Records and making a mix tape in his honor, who should walk in but Roger Miller. 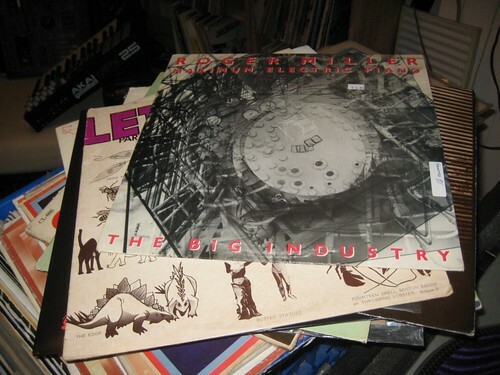 In a moment of chance that seems divine, sitting there on the top of the pile of Human Sexual Response, O Positive, Neighborhoods, Lyres, Treat Her Right, Throbbing Lobster, Limbo Race, Wrong, The Dark and Morphine records was Roger’s own 1987 release The Big Industry. Not only is this a significant record for me personally (Roger played twice at my college around this time and was nearly attacked with a machete in my dorm after a show), the release party for this record was the first real rock show at the Middle East. Billy had already been trying book bands in the restaurant’s back room but they had been reluctant. Roger beat him to it for the release of The Big Industry and Billy came back to the Middle East upset that he had been scooped. The next month, in November 1987, he convinced them to let him book bands there for his 30th birthday party. It has remained a hub of the Boston music scene ever since. Here’s the mix of mostly 80s’ post punk and pop rock I made in Billy’s honor. In fact, I’m not sure he even liked any of these songs. It’s just a mix that reminds me of him and expresses some feelings about his loss that I could not express better in any other way. Plus, its just a bitchin Boston mix. My favorite kind. Over the years, Billy paced me (and passed me often) throughout the Cambridge music scene. A dervish dancing like it was a Dead Kennedy’s show to the mild mannered Kora player he had booked at the Green Street Grille. Shirt open to the navel always. Beer barely in hand. A dapper disheveled Boston rock impresario racing through Cambridge with his heart on his suit jacket sleeve leaving a trail of musical madness in his wake. Who will teach the children to slam dance in their slippers and nightshirts? He booked the Pineapple Ranch Hands and so so many other bands over the years. Hell, I even interviewed him for my dissertation on Boston nightclubs. Although we were not close personally, we knew each other well after 20 years of bumping into each other at shows. For so many people, Billy was the best friend you saw too little and always had the best time with. Maybe the closer you got, the more likely you were to get burned from his intense heat. But from my safe distance, Billy was a comet that streaked through most of my adult life. Usually when I was having the most fun. Though I always met Billy over music, in the end I knew him best through records. Over the years, I encountered him often on my rounds. At a yard sale here. At a Goodwill there. Often at Mojo Records in Cambridge. In March 2006 Mojo closed. I was there filming between Sunday March 19 and Tuesday March 21. Billy was there too. Every day. In the end, it came down to a race between Billy and the Goodwill Guys. I guess it always did. This time, I got it on film. Billy was never quite so Billy. Boston will never quite be the same without him.